Your pet has had a big day today undergoing their dental surgery, now it’s time for some rest and relaxation. Keep your pet quiet tonight as he/she recovers from surgery. You can feed a normal meal but if your pet has had teeth removed give soft food only for the first 3 days. Give any medication as has been instructed by your vet. At Southern Cross Vets we aim to provide premium dental care for your pet. All dental procedures are performed under a full general anaesthesia. Once anaesthetised complete dental X-rays of your pet’s mouth will have been taken. This allows your veterinarian to assess the roots of each tooth for the presence of disease. Tartar and calculus are then scaled away from the teeth and each tooth is polished until they are squeaky clean. The health of each individual tooth is then checked using a dental probe. If evidence of dental disease is present on probing or x-rays of the teeth then your vet may decide that tooth extraction is necessary. For small teeth in the mouth this is a simple procedure, but for larger teeth such as the canines, this can be a lengthy surgical process. Diseased teeth must be removed as they are a source of pain and inflammation in the mouth. Continual inflammation caused by teeth decay can weaken the bone of the jaw and lead to jaw fractures. If extractions were performed your pet would have been given pain relief on recovery. Depending on nature of the extractions your pet may have some pain relief for you to give at home over the next few days. My pet’s teeth are finally clean- now what? Now is the time to take steps to avoid future periodontal treatment. Within 12 hours after teeth cleaning plaque will begin to accumulate once more on your pet’s teeth. Gingivitis will recur in 2 weeks if no home care is provided. Luckily there are many ways to slow dental disease, so your pet has a cleaner mouth for longer! Teeth brushing is the gold standard of dental prophylaxis. Teeth brushing involves the mechanical removal of plaque from the tooth with a small soft bristled brush. It may be daunting at first, but many animals can be trained to tolerate (and even enjoy!) their teeth being brushed. This process can be commenced by running a finger alongside your pet teeth followed by a reward. Dipping your finger into beef stock for dogs (or vegemite or fish paste for cats) prior to brushing can improve the experience for your pet. Once your pet accepts this, graduate to the use of a soft makeup pad rubbed along the outside of the teeth. Eventually, you can move to a soft-bristled finger brush. There is tasty pet-friendly toothpaste which you can try, however, these are not essential as it is the mechanical action of brushing which is most effective at preventing tartar accumulation. Dental diets are composed of larger kibbles which do not shatter in your pet’s mouth and force them to chew- cleaning the outside of the teeth in the process. Some dental diets contain phosphate which precipitates out calcium in saliva so that it does not turn any plaque present on the teeth into harder calculus. At Southern Cross Vets we advocate the use of Royal Canin Dental Care kibble as an ideal dental diet. Raw and cooked bones: Raw bones can carry nasty bacterial infections such as salmonella, as well as being high in fat. Cooked bones are a particular risk as they can shatter and become lodged in your pet’s throat. 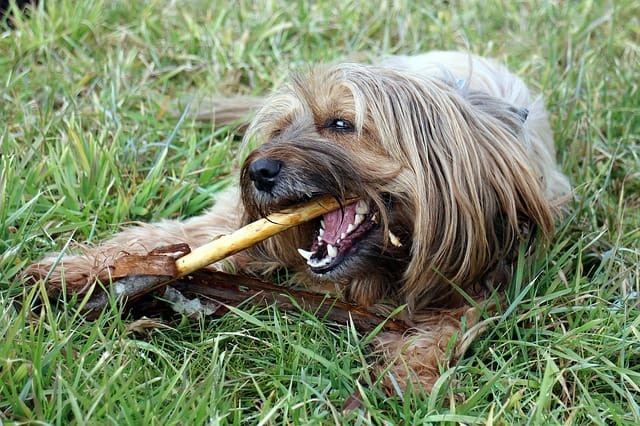 Stones: Dogs that chew on stones are prone to tooth fractures. Hexarinse is a mild palatable antiseptic agent that may aid in the prevention of plaque accumulation post dental surgery. You can use hexarinse to help keep your pet’s mouth clean following dental surgery aiding the healing of extraction sites. Ask your vet about hexarinse at your next dental appointment. You should organise a dental check-up at least once a year for your pet. Your vet may recommend another dental scale to remove any plaque or tartar build up, which will increase the effectiveness of any dental homecare you are providing. Book an appointment today or contact us for more information.